Dear Friends, My heart is overflowing with all that is happening with my Precious Oils ministry both here and in Israel. I do hope that you find a few moments to read this letter, I will try to keep it short, but as always there is always interesting stories within the stories of my life. In March, I went to Israel to work on a book called The Healing Rose; The Rest of the Story of Esther’s Purification. It was my husband, David, who suggested that I go during Purim and devote set-apart time to complete the work. I spent four days studying at the Hebrew University library. It was here where I uncovered some amazing writings from the late 1800’s and early 1900’s centered on Biblical flora, healing plants, ancient spice route information and many other things pertaining to my love and passion, and my Precious Oils ministry of the plants of the Bible. It was my goal to write after I had studied at the university. I planned to go to a quiet prayer house in the desert; but my plans changed. The care-taker of the prayer house had a work-related emergency and wouldn’t be able to meet me on the day I was scheduled to arrive. This left me in a bit of a dilemma of where I would be going. I made a call to a place I had wanted to visit for years since I began staying at places in the desert known as The Scented Cities, and other ancient incense route locations. I arrived with the thought of staying there two nights, but I ended up staying three. Little did I know that there was a spice conference being held within a few kilometers, in which anyone staying at this ancient, historical site was invited to also attend? How does this happen? I was detoured from one place only to find myself sitting among Israeli’s and other nations who came together for one purpose; to learn more about the ancient spice routes. This was the third year for this conference; the first two years it had been held in Eliat but this year after the recent finding of a piece of pottery that had an inscription stating that the Queen of Sheba was from Yemen the location got changed to be on the ancient incense route. Did I mention that the conference was all in Hebrew? That didn’t matter, I loved it! I had opportunity to meet the two conference organizers, both very well-educated, English speaking and historians of the incense route. During the afternoon break I also met a really nice lady who wanted to meet me when she found out that I wrote about the plants of the Bible. We chatted and she said I needed to come to her home. I told her that I was going back to Jerusalem, and she said that is where she lived. The short version of this story is one evening I went to her home to “chat” about our love of spices. She began our conversation with “So, how did you come to the conference?” I explained that “I just so happened” to be staying at a guest caravan where the group was invited to the conference. And, I extended my stay so I could be part of the conference for one day. Then, I asked her what brought her to the conference. She replied, “My husband” who at that moment walked into the kitchen. I nearly fell out as I extended my hand to once again meet one of the conference organizers. New spice and incense loving friends. I have an invitation to visit them again, and they want me to bring them copies of my books. Another really neat thing happened actually while I was staying on the incense trail. The director of the project came into the dining hall where I was writing. He asked if I had a moment, he wanted to show me around. As we walked around the grounds he lead me to two plants, given to the site by an archeologist whose job is to plant the desert. 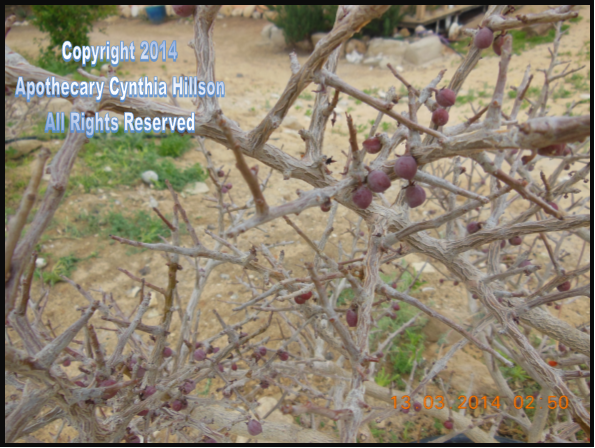 I had seen this plant before; it is the ancient Balm of Gilead which is being cultivated throughout Israel in select locations to see what part of the desert the plants can flourish. (I’ve actually touched and smelled this plant at two other places in the desert on previous journeys.) As he handed me a berry to smell he began to tell me about part of the vision, and the mandate from the government of Israel, of where we were standing. He perked my interest, we chatted and then he went back to the construction project he was working on. I thought “Hmm that was nice that the director took time to show me around this amazing place.” I know people in his position are very busy, they see new people all the time, and they often never see you twice, so I thought. A few weeks after I returned home I received a personal e-mail from the director; it was a friendly handshake thanking me for coming and do I think that I will be returning? I really did love the place and told him so, as well as my heart’s desire to return. To shorten the story is that I’m planning on returning in October, this time to cook for some groups who will be staying and working on this ancient incense route site. Things even go deeper beyond cooking and doing laundry for groups from around the world this fall. As the director and I have conversed he is feeling that Precious Oils is to be part of a “garden project” vision at this very special archeological site. It’s not only on the incense trail it was one of the stopping points of the Children of Israel during their 40 years of wandering. It also is a place that is prophesied as part of the future borders of Israel. (Ezekiel 47 & 48). I can’t even begin to explain to you what happened to me as I read his e-mails. He said “I had a hunch about you” and that is why he personally reached out to me. He’s said that many people “want” to be part of greening the desert, but he feels that I am the one for this particular project because of my passion for Israel, the Lord, and the flora of the Bible. So, bottom line is this, prayer and financial support is needed as I am committed to cook and serve in Israel at this site for four or five weeks in October and November. David needs to also come to Israel while I am there, he has only been once, in 2000. It will be important for us to walk the land together to see how David and I, and Precious Oils, fits into the future green space desert plantings that will benefit generations to come. If you want further, and more precise information about the Garden of the Ages please feel free to contact me. Please note that I’ve set up a new e-mail address, BlossomingIsrael@aol.com, for the desert garden project, and yes, my PreciousOils@aol.com is still to use if that is in your address book. Tax deductible giving is possible (and greatly appreciated). Checks need to be payable to Liberty Ministries, Inc., please memo Israel/Hillson Mission. Send checks to: Cynthia Hillson 107 Bradberry Street Mooresville, NC 28115 Thank you for your love and support. Just a few other notes. Katie, our missionary daughter is doing well. She works for a church in Hong Kong as the Children’s Church Director where each week she oversees the lessons and volunteers for over 100 children, infant to 12. Thank you for your prayers and support for her as well as the timing for me to take her more of her personal items to her; she doesn’t plan to return home for a year, or two. She was home for the holidays; it was the first time in four years that all six children, spouses, grandchildren, David and I were all together. It was a fun, and chaotic, few hours. Our fifth grandchild is due in a few weeks!! Abigail graduates college and will soon be off on her own. The timing couldn’t be better to be empty-nesters with the opportunity(ies) that await us in Israel.